Mash the avocado flesh in a large bowl: Cut the avocados in half, running a knife around the pit from top to bottom and back up again. Twist the halves in opposite directions to release the pit from one side. Scoop out the pit, then scoop the flesh from each half. With an old-fashioned potato masher, large fork or back of a large spoon, coarsely mash the avocado. Scoop the onion into a strainer, rinse under cold water, shake off the excess, then add to the avocado, along with the Habanero. Finely grate zest (colored part only) from the citrus add them to the bowl, then juice both fruits and add 2 tablespoons of the lime juice and 1 tablespoon of the orange juice. Add the chopped cilantro and clementines, then carefully stir everything together. Taste and season with salt, usually about 1 teaspoon. Cover with plastic wrap directly on the guacamole and refrigerate until you’re ready to serve. 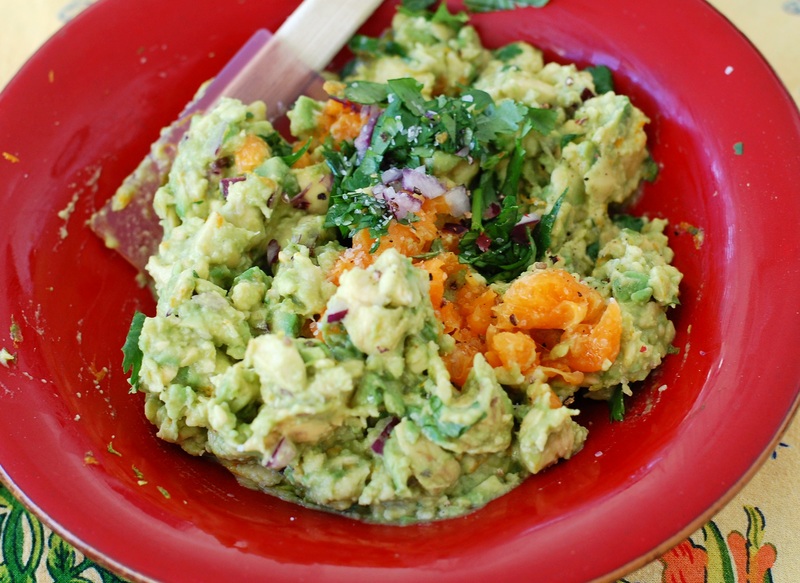 At the last moment, uncover the guacamole, sprinkle with chopped clementines and serve. Steam seasoned chicken breast (use taco or fajita seasoning), shred with fork and taste for seasoning. Add your favorite grated cheese, I like the Mexican blend for the chicken taquitos. Dampen 2 paper towels, and place tortillas between them. Microwave for about 1 minute, until tortillas are warm and pliable. Fill each taco with about 2 tablespoons filling, roll and secure with toothpicks, bake in 375° and bake until crispy, 14 to 16 minutes.